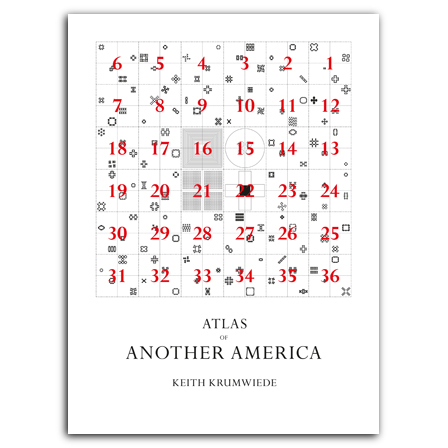 With Atlas of Another America, Keith Krumwiede has written a bold and original work of speculative architectural fiction that calls on Americans—and, increasingly, the rest of the world—to seriously reconsider the concept of the single-family home. Presented in the style of a historical architectural treatise comprised of over 150 drawings and images, Krumwiede’s “Freedomland” is a fictional utopia of communal superhomes constructed from the remains of the suburban metropolis. Freedomland’s strangely familiar visions draw on a long lineage of social and architectural thought—from Owen and Fourier to Ledoux, Branzi, and Koolhaas—in which imaginary but not entirely implausible worlds are envisioned in order to reframe reality and direct us toward new territories of action. An appendix collects five essays pertinent to the origins of Freedomland. Among them, “Atypical Plans,” a redacted and reconstructed spin on Rem Koolhaas’s landmark text “Typical Plan,” reflects upon the American Dream, houses, and the Great Recession; “Supermodel Homes” examines the mad genius of Texas developer David Weekley; and "Notes on Freedomland" assembles an account of domestic desires, communal cravings, and architectural ambitions. The book closes with the short story “New Homes for America” in which a young architect, working under the pressure of a deadline, produces new forms for communal living. , born 1964, Dean of Architecture at The California College of the Arts. He is a writer and designer whose work has been widely published and exhibited. He has taught at Rice University, Yale University and the New Jersey Institute of Technology. is the Gus Sessions Wortham Professor of Architecture at Rice University's School of Architecture in Houston, TX.